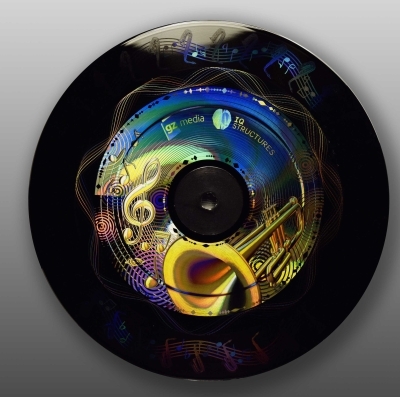 IQ Structures, a Czech research & production company focused on optical nanotechnologies, introduced a new technology for embossing holograms on gramophone records. A traditional vinyl record is thus changed to an outstanding decorative item. The hologram has no impact on the quality of sound and keeps long-term brightness. The technology is ready for mass production. A pilot project was realised together with GZ Media, the largest producer of vinyl records in the world. The hologram is replicated directly into the vinyl (ethenyl in chemical terminology) and meets all requirements, including covering a lifecycle spanning many years and enduring mechanical depreciation. IQ Structures´ technology is an excellent example of adding holograms to nontraditional materials. There are still hundreds of items, where adding holograms can be useful, either as anti-counterfeiting protection or for decorative purposes. It is very likely that holography will expand into many new areas, including food and other items of everyday use in the following years. “Holographic stickers are sometimes sufficient, but embossing a hologram directly into the protected item is more elegant and provides a stronger anti-counterfeit protection. However, a range of technological issues must be solved for each application. I am delighted to state that we have moved the borders of possibility and demonstrated that holograms are also working on non-traditional materials,” said Roman Houha, the head of the project team in IQ Structures. Attempts to add holograms on gramophone records have been already made, but they focused just on space without sound usually used for a central picture disc. IQ Structures´ technology allows the hologram to be embossed into the grooves carrying the sound recording. This IQ Structures´ technology was awarded the Excellence in Holography Award 2018 by IHMA (International Hologram Manufacturers Association). The company is also a winner of the prize for the best origination from the same competition. This combination confirms that IQ Structures is uniquely positioned for such products as it connects an advanced ability to emboss holograms into new materials with unique origination options, including high brightness even on poor lighting, gradual 3D objects and small animations.